WINSTON-SALEM, N.C. (Jan. 22, 2019) - Valentine's Day is less than a month away, and the Winston-Salem Dash have a perfect event in store for you and your loved one. 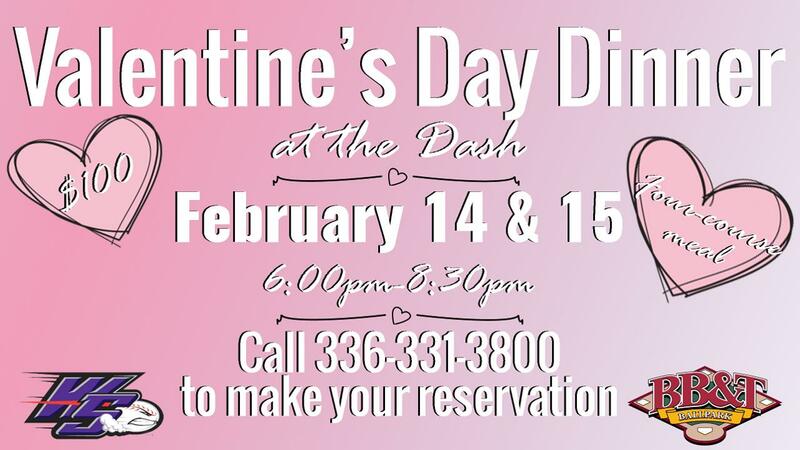 Once again, the Dash are hosting a Valentine's Day Dinner on Thursday, February 14, and Friday, February 15, starting at 6:00 p.m. at BB&T Ballpark. Couples will enjoy a delicious four-course meal in our intimate Flow Club Restaurant for just $100 per couple. This price does not include tax or gratuity. Reservations will be accepted through February 13, and they must be made by calling (336) 331-3800. There are six reservation times available: 6:00, 6:30, 7:00, 7:30, 8:00 and 8:30 p.m.
Plus, all couples who make a reservation for our Valentine's Day Dinner will receive two tickets to our home opener on Thursday, April 11, at 7 p.m. against the Potomac Nationals (Washington). When making your reservation over the phone, you will choose one option from each of the below lists. Complimentary tea, soda and water will be on hand, along with one beer or wine per person. Meanwhile, other alcoholic beverages are available for purchase. Attendees can enter through the VIP doors behind home plate, which can be accessed off Peters Creek Parkway. Parking is available in the VIP lot. The Dash's 10th anniversary season at BB&T Ballpark is less than three months away, and fans can guarantee their seats to the biggest games through full- and partial-season packages. Also, single-game tickets are on sale now. For more information, call the Dash at (336) 714-2287 or visit wsdash.com.